Europe's Planck satellite - a flagship mission for the UK Space Agency - has compiled the most detailed map ever created of the cosmic microwave background (the relic radiation from the Big Bang). The new map refines our understanding of the Universe's composition and evolution, and unveils new features that could challenge the foundations of our current understanding of its evolution. The image is based on the initial 15.5 months of data from Planck and is the mission's first all-sky picture of the oldest light in our Universe, imprinted on the sky when it was just 380 000 years old. Dr Chris Castelli, Acting Director of Science, Technology and Exploration at the UK Space Agency, said, "We're immensely proud to be playing a key role in this amazing discovery. With its ability to make such detailed and accurate observations, Planck is helping us to place the vital pieces of a jigsaw that could give us a full picture of the evolution of our Universe, rewriting the textbooks along the way." "The CMB temperature fluctuations detected by Planck confirm once more that the relatively simple picture provided by the standard model is an amazingly good description of the Universe," explains George Efstathiou of the University of Cambridge. The properties of the hot and cold regions of the map provide information about the composition and evolution of the Universe. Normal matter that makes up stars and galaxies contributes just 4.9% of the mass/energy density of the Universe. Dark matter, which has thus far only been detected indirectly by its gravitational influence, makes up 26.8%, nearly a fifth more than the previous estimate. Conversely, dark energy, a mysterious force thought to be responsible for accelerating the expansion of the Universe, accounts for slightly less than previously thought, at around 69%. The Planck data also set a new value for the rate at which the Universe is expanding today, known as the Hubble constant. At 67.3 km/s/Mpc, this is significantly different from the value measured from relatively nearby galaxies. This somewhat slower expansion implies that the Universe is also a little older than previously thought, at 13.8 billion years. 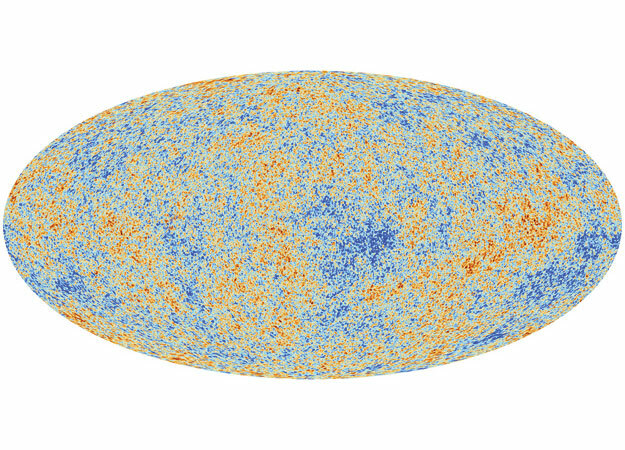 Although this primordial epoch can't be observed directly, the theory predicts a set of very subtle imprints on the CMB map. Previous experiments have not been able to confidently detect these subtle imprints, but the high resolution of Planck's map confirms that the tiny variations in the density of the early Universe match those predicted by inflation. 'The sizes of these tiny ripples hold the key to what happened in that first trillionth of a trillionth of a second. Planck has given us striking new evidence that indicates they were created during this incredibly fast expansion, just after the Big Bang', explained Joanna Dunkley of the University of Oxford. But because the precision of Planck's map is so high, it also reveals some peculiar unexplained features that may well require new physics to be understood. Amongst the most surprising findings are that the fluctuations in the CMB over large scales do not match those predicted by the standard model. This anomaly adds to those observed by previous experiments, and confirmed by Planck, including an asymmetry in the average temperatures on opposite hemispheres of the sky, and a cold spot that extends over a patch of sky that is much larger than expected. Professor John Womersley, Chief Executive of the Science and Technology Facilities Council (STFC), said, "Planck has given us an amazing picture of the very earliest moments of the Universe. These results are the culmination of many years of work by UK scientists and engineers supported by STFC. This kind of project can sometimes seem expensive but the payoff in science and technology more than justifies the investment we've made.'"